A squirrel baffle is a useful tool for protecting your bird feeders from squirrel assault and robbery. When installed properly, they will keep those pesky squirrels from stealing your high quality bird seed meant for the birds, not for the mammals. It will also prevent squirrels from getting into your bird houses and harming nestlings. 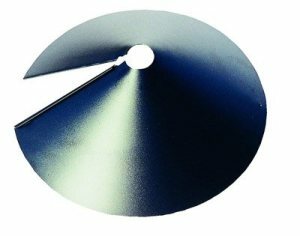 This 18" squirrel baffle can be easily installed and adjusted on existing feeders without having to remove your bird feeder from the pole or hanger. 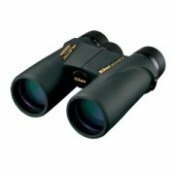 Made from durable, powder-coated steel that will endure outdoor weather abuse. "I have spent the last 2 years trying to keep grey and red squirrels off my bird feeders. I could write a book about all the schemes, tricks, ideas, I tried and tried, all of them eventually failing. Except for this product. 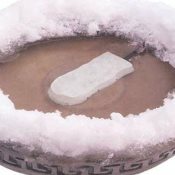 This thing works!!! It took one adjustment to find the correct height on the pole, but since I adjusted it, almost 6 weeks ago, the squirrels have been beaten, totally and completely. Below are well reviewed bird feeder squirrel baffles that actually work. These are durable, well designed squirrel guards that will keep the squirrels puzzled and frustrated. Squirrels can jump 11 feet down from a tree branch or other structure and can leap 4-7 feet vertically, so do not underestimate when choosing a place for your bird feeder. If you hang your feeder from a branch or something similar, you will want to install a baffle above the feeder that tilts. Tilting squirrel baffles that are not stationary and move when a squirrel lands on it from above will be the best at deterrence. Make sure to install your baffle high enough above the ground, at least four feet, out of squirrel-jumping distance. 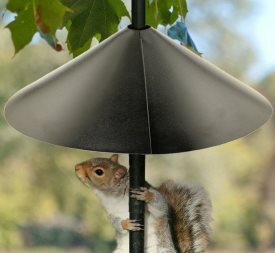 Squirrels can climb the most slickest poles with ease so if your bird feeder is mounted on a pole, you will need to install a squirrel proof baffle below the feeder on the pole itself. Cooking oil, vasoline or grease alone will not stop the squirrels. For more information about keeping squirrels out of your bird feeders, the Cornell Lab of Ornithology has written a great article with squirrel deterrence tips and more about installing a squirrel baffle (pdf file, opens new window). How to get rid of squirrels or squirrel-proof your feeder? Do not make it easy for them! Make Your Own Squirrel Baffle - A simple, homemade squirrel guard you can make for cheap. 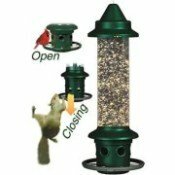 Squirrel Proof Bird Feeder Pole - Includes floating baffle that keeps squirrels from reaching your feeders. Bird Feeder Pole Favorites - Best bird feeder poles for hanging your feeders and attaching baffles to for a squirrel proof pole. Free squirrel Feeder Plans - Feed the Squirrels away from your bird feeders as an alternative option to the fight. Squirrel Feeder - Best squirrel feeders if you do not want to build your own.